Iranian President Hassan Rouhani, center, waves to his supporters as he is accompanied by Vice President for Women and Family Affairs Shahindokht Molaverdi in a campaign rally for the May 19 presidential election in Tehran, Iran, May 9, 2017. 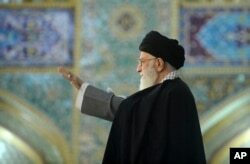 Determined to protect a dominant security role and vast economic interests, Iran's Revolutionary Guards military force is quietly backing a hardliner in May 19 presidential polls, with an eye towards a bigger prize: the succession of the supreme leader. But the Islamic Revolutionary Guards Corps (IRGC), and the Basij, a volunteer militia under the Guards' command, are taking steps to promote the candidacy of his main rival, hard-line cleric Ebrahim Raisi. Media outlets affiliated with the Guards have been criticizing Rouhani's performance in power. Experts who study the force say they are also likely to use their street muscle to help get Raisi supporters to the polls. "The IRGC will be running buses and mini-buses to make people vote. They will be mobilizing voters not only in the rural areas but also the shantytowns around the big cities," said Ali Alfoneh, a senior fellow at the Atlantic Council who has done extensive research on the Guards. "They want their supporters voting." The Islamic Republic's security hawks are worried that Rouhani with a fresh mandate would chip away at prerogatives that have given the Guards huge economic and political power. Whether or not Rouhani wins a second term, the bigger prize is controlling who will succeed Supreme Leader Ayatollah Ali Khamenei, whose power far exceeds that of the elected president. "This election is not only about choosing the president. It's about succession after Khamenei," said Alfoneh. "The IRGC believe that it's their chance to completely eliminate the technocrats and control the succession process after Khamenei." In this picture released by official website of the office of the Iranian supreme leader on March 21, 2017, Supreme Leader Ayatollah Ali Khamenei waves to a crowd in his trip to the northeastern city of Mashhad, Iran. Rouhani himself sits in the assembly as one of its biggest vote-getters, and he and his allies nearly swept the seats from the capital Tehran. Sadeghi wrote that media outlets affiliated with the Guards were also “working against reformists and the supporters of the government,” according to the Iranian Labor News Agency (ILNA) which printed a copy of the letter. The disputed 2009 presidential elections, which put Mahmoud Ahmadinejad into office for a second term, led to the most widespread unrest in the history of the Islamic Republic. 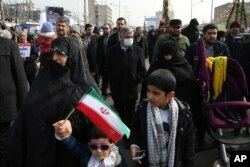 Millions of protestors took to the streets in Tehran and several other large cities. Commander of Iran's Revolutionary Guard Gen. Mohammad Ali Jafari, center, attends an annual rally commemorating the anniversary of the 1979 Islamic revolution, which toppled the late pro-U.S. Shah, Mohammad Reza Pahlavi, in Tehran, Feb. 10, 2017. While in office, Rouhani has clashed repeatedly with the Guards about their contracts and business interests. “The entry of armed forces to economic temptations can distance them from their original duty and goal,” Rouhani said in a speech last month, according to the official website of the presidency. The Guards, for their part, have criticized the deal with Western powers negotiated by the Rouhani government, under which most international financial sanctions were lifted in exchange for curbs on Iran's nuclear program. Rouhani has touted the agreement as his top achievement. “This is a lie. It's an insult,” he said, according to Fars News.